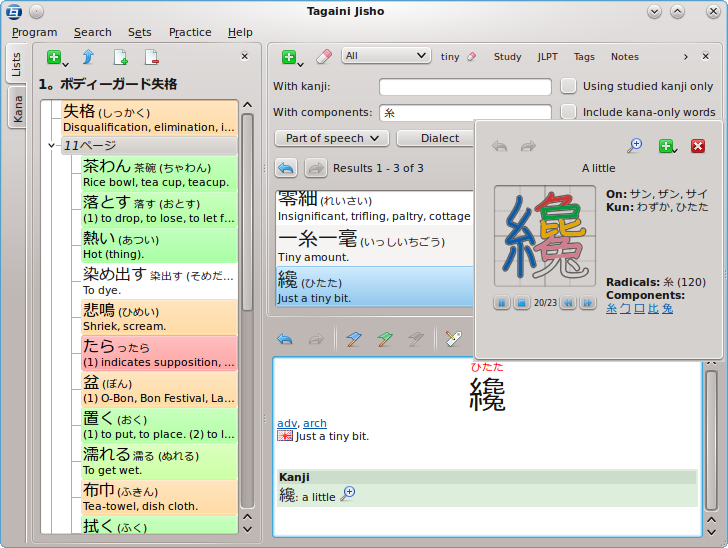 Tagaini Jisho is a free, open-source Japanese dictionary and kanji lookup tool for Windows, MacOS X and Linux and aims at becoming your Japanese study assistant. It allows you to quickly search for entries and mark those that you wish to study, along with tags and personal notes. It also let you train entries you are studying and follows your progression in remembering them. Finally, it makes it easy to review entries you did not remember by listing them on screen or printing them on a small booklet. Tagaini Jisho also features complete stroke order animations for more than 6000 kanji. Powerful searching options for both vocabulary and kanjis, such as part-of-speech, JLPT level, etc. Lot of context information related to your study, like transitive/intransitive equivalents of verbs, studied words using a given kanji, etc. Like it? Download it for your system! Tagaini Jisho is Free Software distributed under the terms of the GNU General Public Licence, version 3. Tagaini Jisho is powered by Qt and SQLite. JLPT levels for (old) levels 4, 3 and 2 come from the JLPT study page, with kind autorization. Level 1 vocabulary was extracted from lists provided by Thierry Bézecourt and Alain Côté. Levels for N3 come from the JLPT Resources page, which has also been used to fine-tune other levels. Extra translations for vocabulary and kanji meanings are provided by the jmdict-i18n and kanjidic2-i18n projects. The idea of starting this project has come after more than one year of intensive usage of the great Kangoroo dictionary. Do you like Tagaini Jisho? Tagaini is free software, but has a cost (in time, efforts and sometimes money) for its developer. You can show your appreciation by making a donation.